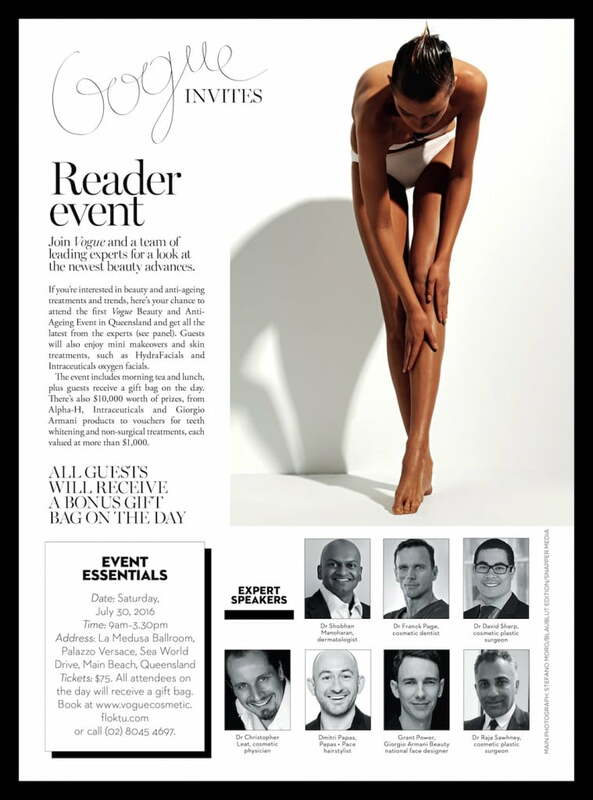 Dr Sharp will feature as one of Vogue Magazine Australia’s experts in plastic and cosmetic surgery this weekend at the magazine’s inaugural Beauty & Anti Ageing Event at Palazzo Versace on the Gold Coast. Speaking on the various facial cosmetic surgery procedures available to all age groups, Dr Sharp will share his insights into rhinoplasty, eyelid reduction (blepharoplasty), facelift, otoplasty (ear pinning), neck lift, genioplasty (chin augmentation) and brow lift surgery. Update: Vogue has advised us that tickets to this year’s event have sold out, but if you have signed up for Dr Sharp’s e-news, keep an eye out for the highlights in next month’s issue, and we will let you know when the next Vogue event comes around!